Come back to Cherry Mischievous - WW28 and give us the url of your post in a comment so that other WW28 readers can find your WW28 offering. She zoomed in on two men who lingered on a bench at the corner of the square, and recognized the plain clothes, bad shoes, and haggard look of a surveillance team five days into a job. When Katarina Bishop was three, her parents took her on a trip to the Louvre...to case it. For her seventh birthday, Katarina and her Uncle Eddie traveled to Austria...to steal the crown jewels. 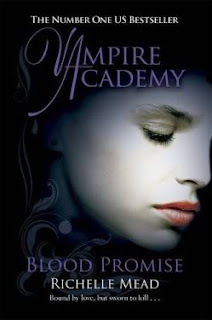 When Kat turned fifteen, she planned a con of her own--scamming her way into the best boarding school in the country, determined to leave the family business behind. Unfortunately, leaving "the life" for a normal life proves harder than she'd expected. Soon, Kat's friend and former co-conspirator, Hale, appears out of nowhere to bring her back into the world she tried so hard to escape. But he has good reason: a powerful mobster has been robbed of his priceless art collection and wants to retrieve it. Only a master thief could have pulled this job, and Kat's father isn't just on the suspect list, he is the list. Caught between Interpol and a far more deadly enemy, Kat's dad needs her help. For Kat there is only one solution: track down the paintings and steal them back. So what if it's a spectacularly impossible job? 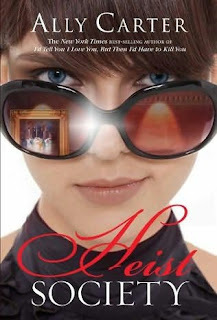 She's got two weeks, a teenage crew, and hopefully just enough talent to pull off the biggest heist in history-or at least her family's (very crooked) history. Source: Info in the About This Book was taken from goodreads at http://www.goodreads.com/book/show/6574102-heist-society on 27/03/2010. You have to be a follower of Cherry Mischievous blog and/or CherryD member to enter the contest. Being both will gain you 5 extra entries. Please tell me if you are in your comment here so that I will not forget to give you your extra entries. Contest is international and ends on March 31. Questions? Ask! Shoot us an email (mischivus101-contsgiveaways [at] yahoo [dot] com). 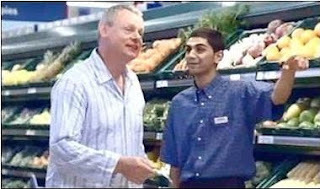 Please write PYJAMA POLICE CENTRAL in the subject line. Please see the Disclaimer as this forms part of the contest rules. 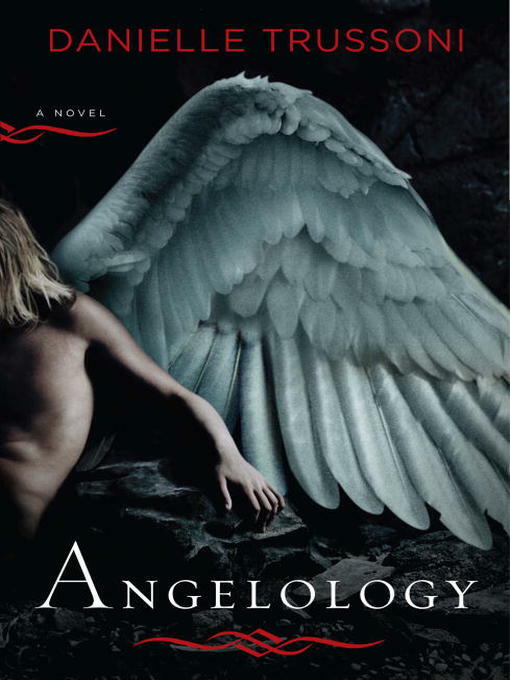 I would like to thank Penguin UK for the review copy of Angelology by Danielle Trussoni received today. 1943: The preserved corpse of an Angel is discovered in the Devil's Throat Gorge in the Bulgarian mountains. Only a select few are party to this discovery, including a young nun who is later taken in a state of distress to a Convent in upstate New York and never speaks about it again. Until now. The present: When Sister Evangeline finds mysterious correspondence between Mother Innocenta of the Saint Rose Convent and legendary philanthropist Abigail Rockefeller, it confirms that Angels once walked among us - and their descendants, the cruel Nephilim, still do. Indeed, the Nephilim are hunting for artefacts concealed by Abigail Rockefeller during the Second World War - objects that will ultimately allow them to enslave mankind - and have so far been prevented from reaching their apocalyptic goal by one clandestine organisation: the Angelology Society. And if the Angelologists are to stand any chance of winning this new battle in the ages-old war, they must find the artefacts first. But their fate rests in the hands of innocent Sister Evangeline, who holds the key to unlocking Abigail Rockefeller's hiding places ... and whose destiny may yet find her prey to the terrifying Nephilim army, with horrifying consequences for humanity. Angelology moves with electifying sweep from the icy mountains of Bulgaria to Nazi-occupied Paris, to twentieth century New York, as the greatest conspiracy of them all is finally brought to light. Source: Info in the About Angelology was taken from the publishers' press release. Win a fancy dinner at The Thrillionth Page! Contest does not seem to have any geographical restrictions and ends on April 8. Contest Link: Click here to go to the contest. ... what would happen if I got all these guys in one room with me? .... sushi anyone? Meme Game! Send Carolyn your meme game link by 4/8 to meme@authorcarolyncrane.com to enter. Anyone can play. Details at http://www.authorcarolyncrane.com/. Went to starbucks to have a bit of "me" time and read. It was late and there weren't many people around anymore as you can see. The pic is a bit dark though. As I am sure that everyone can use some "me" time at one time or another.... so, I am giving one lucky winner £5 worth of starbucks card! •You have to be a Cherry Mischievous blog follower via Google Friend Connect to enter the contest and/or a member of the CherryD fandom community. Having both will gain you 5 extra entry credits. If, by the end of this contest, I do not find you among the Cherry Mischievous followers and/or CherryD members, your entry will be invalidated. •The contest participant is responsible for checking that you have a starbucks outlet in your area to go to, to spend the card at, and that your starbucks outlet accepts this starbucks card system as per advertised by starbucks at https://www.starbucks.com/card. If you do not even have a starbucks in your area, then please do not enter the contest. You won't be able to use the card! •The prize is a starbucks card pre-loaded with £5. The winner is also responsible for registering the starbucks card prize (if in the US: https://www.starbucks.com/card/manage/register-your-card; other countries, please check the starbucks site for your country), to validate it for use and to follow the starbucks rules of the use of the card. 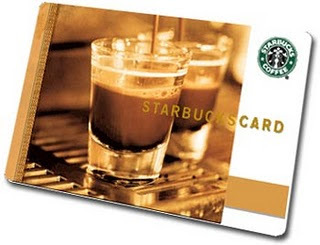 •Contest is open to international coffee lovers so long as there is a starbucks in your area and, that starbucks outlet accepts the starbucks card system as advertised by starbucks at https://www.starbucks.com/card. Making sure that this is true to the contest participant's area is the responsibility of the contest participant. Therefore, if this condition is not true to your area, then don't enter the contest because you will not be able to use the starbucks card! So please check first! •Contest ends on March 31, 2010. •Under 13? Parental permission is required. Email us (mischivus101-candg [at] yahoo [dot] com). •You must have a valid snail mail address and email address to enter this contest. We need the snail mail address to send the starbucks card to. We need the email addy to get in touch with you. •Questions? Ask! Shoot us an email at mischivus101-candg [at] yahoo [dot] com. Please write STARBUCKS in the subject line. I replayed the rest of what Sydney had said, more questions spinning in my head. The Humane award is to honor certain bloggers that are kindhearted individuals. They regularly take part in my blog and always leave the sweetest comments. If it wasn't for them, my site would just be an ordinary book review blog. Their blogs are also amazing and are tastefully done on a daily basis. I thank them and look forward to our growing friendship through the blog world. Rule: Nominate 10 bloggers you feel deserve the Humane award. 2. Pass the award onto 15 bloggers you've recently discovered and think are fantastic. 3. Contact said Blogs and let them know they've won. 1. I'm Taurus and like all Tauruses, very stubborn. 2. My biggest passion besides reading is travelling and photography. 4. I like cheescakes even though I really ought to diet! 5. My boyfriend is a mechanic, like Mercy from Patricia Brigg's Mercy Thompson series. He's tall, dark and not as handsome as Thomas, like Harry Dresden (by Jim Butcher). Congratulations!! The books are on it's way to the winner. Just a reminder folks... 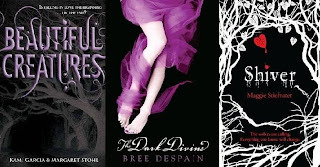 The YA Trio contest ends today! So hurry and enter your chance to win these fabulous YA books for free before it's too late!! "I would like that." Something inside her rang a warning bell as she slid her hand into his and let him lead her away from the tainted spring and moments of mad conversation between the Munro and the Sorcerer. But she ignored them all. Jack West Jr and his loyal team are in desperate disarray: they've been separated, their mission is in tatters, and Jack was last seen plummeting down a fathomless abyss. After surviving his deadly fall, Jack must now race against his many enemies to locate and set in place the remaining pieces of The Machine before the coming Armageddon. WHO ARE THE FIVE WARRIORS? 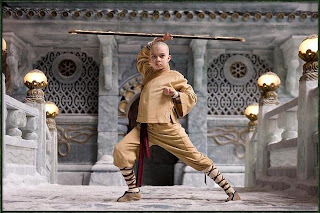 As the world teeters on the brink of destruction, he will learn of the Five Warriors, the individuals who throughout history have been most intimately connected to his quest. Source: Synopsis in the About The 5 Greatest Warriors was taken from the author's website at http://matthewreilly.com/latest.html on 09/01/10. I would like to thank Simon & Schuster for sending me the review copy of The 5 Greatest Warriors by Matthew Reilly. Also received in the same package are: Seven Deadly Wonders and The Six Sacred Stones. Action-packed militaristic adventure. Modern fantasy. The story-telling quality is 4 out 5. Not a dull reading moment! This is the final book of the Jack West Jr. series and ends the saga very nicely. I would give the story climax a 4.5 out of 5. This book tied in all 3 Jack West books to a nice close. The ending is satisfying and does not disappoint despite the high expectations I had. This book retains the same ability to weave fact and fiction so seamlessly it blurs which is a trademark of all three books in this trilogy. Overall, I would give this book an entertainment value of 4 out of 5. Right, because this book (The 5 Greatest Warriors) was given to me for free, I would like to pass this copy (used obviously) to another reader who is likely to enjoy this book. 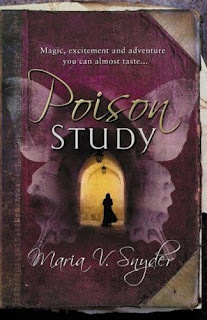 That means, enter this contest only if you are interested and want to read this book! And here is the catch, you have to review this book too. Now, if you do not have a blog or website, that is fine. Post your review anywhere online, i.e., (MySpace, Facebook) any of the free social networks, and/or at amazon... as long as you can give me the URL address of where you posted your review. And it has be viewable by me. Like, if your blog's settings is set to private and can only be viewed by your friends, that means it is not viewable by me... questions? email me. •You have to be a Cherry Mischievous blog follower via Google Friend Connect and/or a CherryD member to enter the contest. Having both will gain you 5 extra entry credits. Entry credits will increase your chances of winning. •There will only be one winner. You have to review this book if you win it. •Contest is open to international readers. •Contest ends on June 18. •Under 13? Parental permission is required. Email us (mischivusfairy-matthewreillycontest [at] yahoo [dot] com). •Questions? Ask! Shoot us an email (mischivusfairy-matthewreillycontest [at] yahoo [dot] com). Please write THE 5 GREATEST WARRIORS in the subject line. Cym Lowell: Book Review Party Wednesday - LIVE! *Amendments made on 31/03/2010 to this post with wordings and additional info added. My mind recoiled from the memories. Unlocking the secret of the 'Seven Ancient Wonders' was only the beginning. The world is in mortal danger. 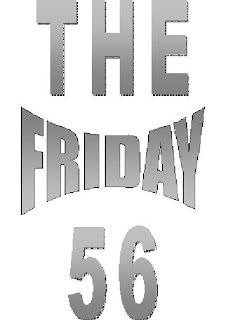 For Jack West Jr and his loyal team of heroes, the challenge now is to set six legendary diamonds known as 'the Pillars' in place at six ancient sites around the world before the deadline for global destruction arrives. The locations of these sites, however, can only be releaved by the fabled Six Sacred Stones. With only the riddles of ancient writers to guide them, and time rapidly running out, Jack and his team must fight their way past traps, labyrinths and a host of deadly enemies - knowing that this time they cannont, will not, must not fail. 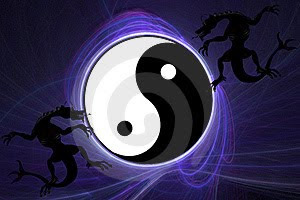 My favourite "part" in the story is the depiction of Lao's "duality" theory and the notion of "balance". In everything good there is darkness. And in all evil, there is light. The duality of all things. Whether that is true or not, I would like to think that it is. The story itself? 4.5 out of 5. It is obviously a fantasy by the mere fact that the story talks of a Tartarus power. Fantasy. 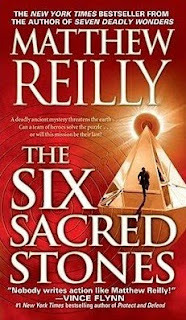 But the way Reilly weaves fantasy with known archeological facts, makes the borderline between fiction and fact blur. Such that the fantasy Reilly weaves seems so real. "Suspension of disbelief"? 5 out of 5. Openning salvo has the protagonist and team running for their very lives from a military invasion complete with assault helicopters, tanks and jet fighters! And then it's non-stop action from there. First chapter and the book had me feeling like I'm short of breath trying to catch-up with events. And that pace keep up until the very end. Story-telling quality? 4.5 out of 5. Cover art? I don't know which to consider really, since different countries have their own different cover arts... The copy I've read is a US cover. The symbolism is quite appropriate to the story but not very attractive to my fantasy buff eyes. 3 out of 5. The story has a cliffhanger ending. Normally I hate cliffhanger endings with a passion. And this is the only reason this book is not a 5 cherries. But still the ending manages to close the dilemma presented in the story and thus climaxed the book well. Overall, I would say that this book has an entertainment value of 4.5 out of 5. Definitely a recommended read! Though being Book 2 in the Jack West Jr. series, it is highly recommended that you read book 1 first for a reader to understand what is going on. My review of book 1, Seven Ancient Wonders, is here. This book was given to me for free by the publisher for review purposes.